André's (1889) description is at . 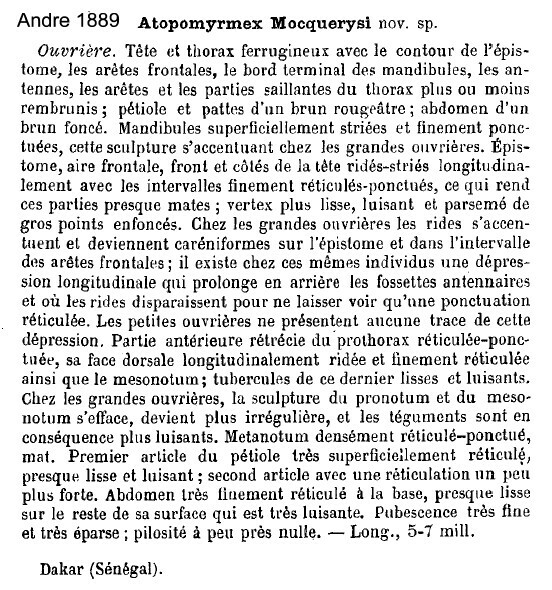 Forel's (1912b) description of the queen and male is at . 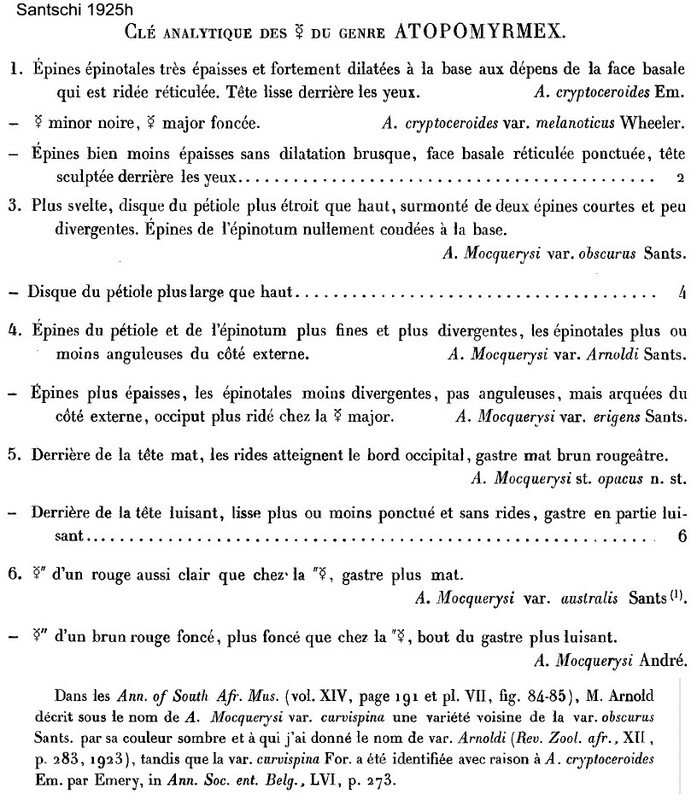 Santschi's (1914e) description of australis is at . 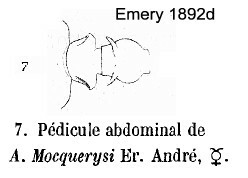 Arnold (1916: 190) gave a translation of of what he denoted as curvispina but as a variety of mocquerysi, which it clearly is (as was recognised by Santschi, 1925h, in a footnote to his key, see above for card, and re-designated as arnoldi) and notes, these are at and . Santschi's (1923e) descriptions of obscura, arnoldi and opaca are at . 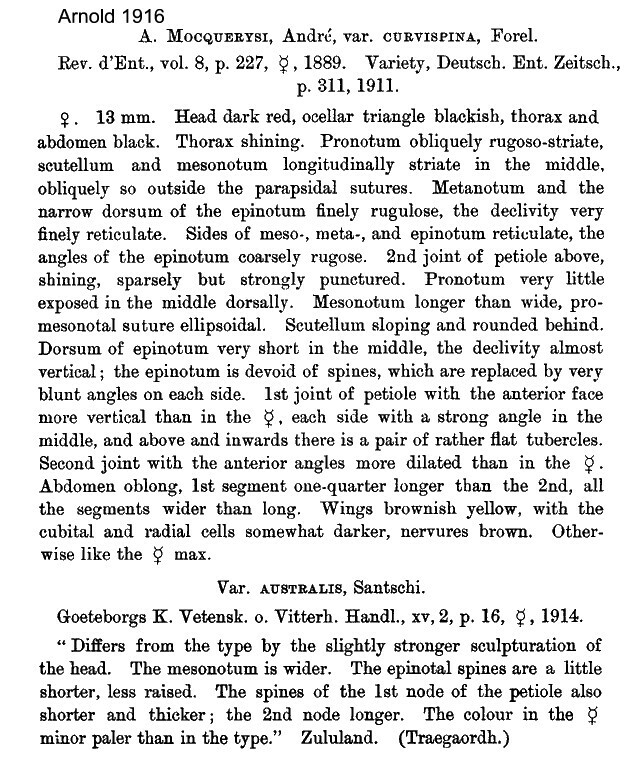 Santschi's (1924b) description of erigens is at . 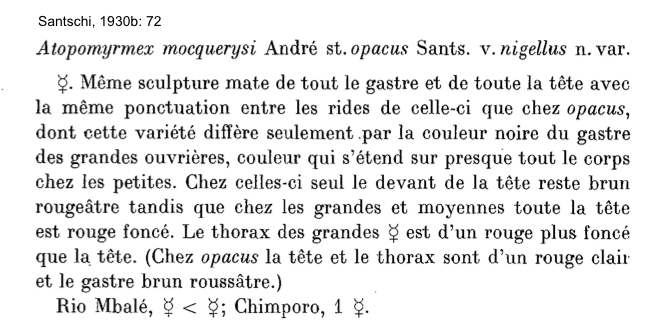 Santschi's (1925h) description of opacus (sic) is at . Santschi's (1925h) key is at . Santschi's (1930b) description of nigellus is at Bolton's (1981b) modern re-description is at . 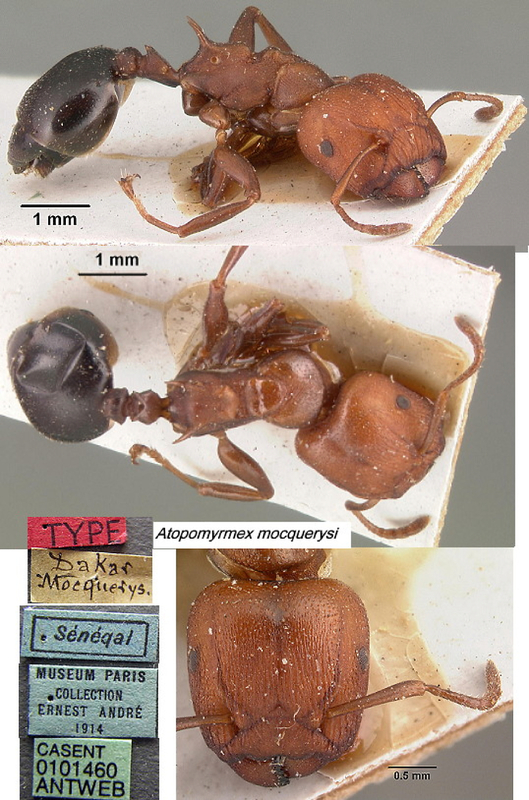 The photomontage of the holotype is collated from http://www.antweb.org/specimen.do?name=casent0101460. The photomontage of a media worker from the type collection is collated from http://www.antweb.org/specimen.do?name=casent0915403. Colour very dark brown-black overall on smallest morph, but largest morph has an orange head, with the alitrunk darker and the remainder as for the smallest morph. 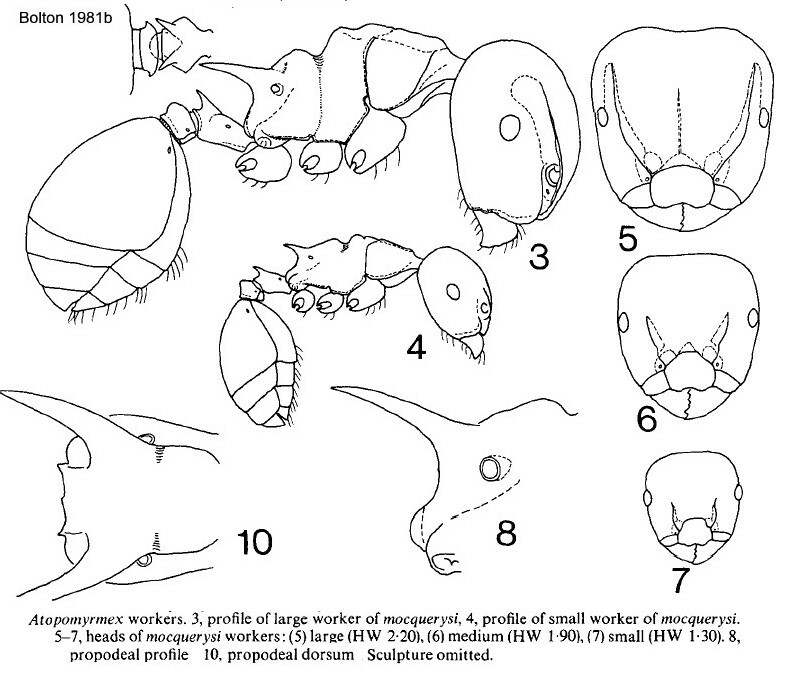 Sculpturation of smallest morph mainly spiculate on the head and alitrunk, rugose on dorsum of alitrunk. 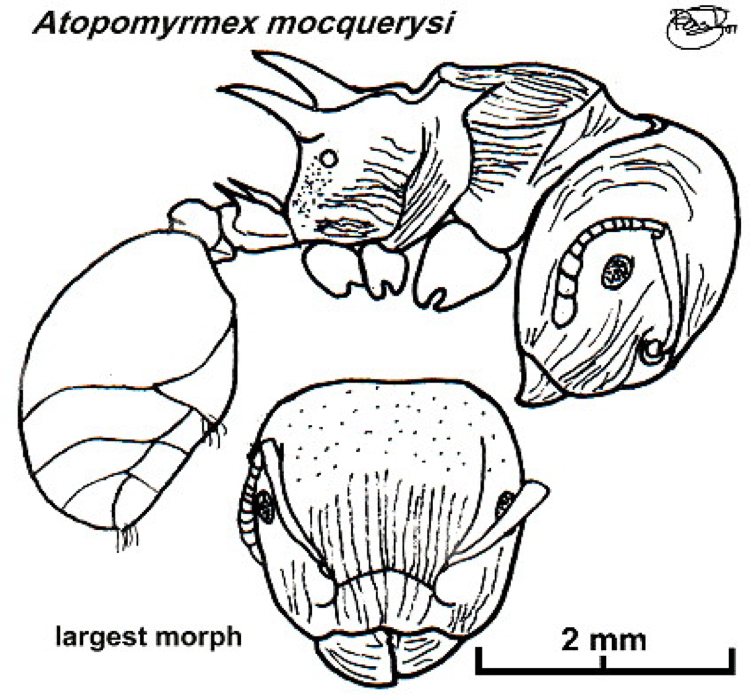 Largest morph with coarse rugae on the anterior of the head and alitrunk, gaster very finely punctate. 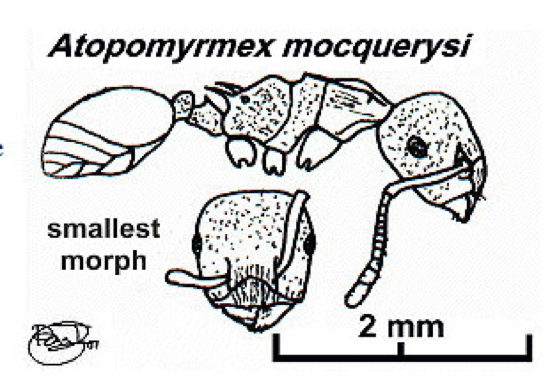 Propodeal spines of smallest morph are flat and acute; of largest morph massive and upturned. Petiole spines of smallest are short and acute; on largest morph moderately long and acute. I found it at the Cocoa Research Institute of Nigeria, Id Ayunre, Block W22 on west edge vegetation, foraging in procession. A pan-African species, very widely distributed in wooded and forested areas. Arboreal, nesting in wood of large trees. Forages in columns on to adjacent trees, including cocoa, and shrubs. Strickland (1951a) described it as essentially a West and Central African species, although it also occurs in East and South Africa. Wheeler (1922) also listed it from Benin (at Cotonou, F. Silvestri) and the "Slave Coast" - eastern Nigeria - western Cameroun. Bernard (1952) reported findings from Guinea, Mt. Nimba area, several workers from Kéoulenta and N'Zo, noting that the specimens were of the small dark variety "nigellus" known from Congo. Uncommon in Nigeria. Bolton (1981b, illustrated) lists CRIN (by himself) and Mokwa, (by C. Longhurst). Adenuga & Adeboyeku (1987) reported it attending mealybugs on cocoa. Found in Ghana cocoa. Strickland (1951a) described it as common locally in small areas (ca. 0.3 ha), very often being associated with Crematogaster ants, although he felt the association was due primarily to mocquerysi tending mealybugs. At CRIG, Strickland recorded it in 36 collections, cf. 778 for Crematogaster striatula. Leston (1973) described it as being of local importance with nests in the hollow branches of tree crowns. Room (1971) found it in fifteen of his collections from cocoa canopy and it features in his consideration of the cocoa mosaic - as being negatively associated with Camponotus niveosetosus (and by derivation with the dominant Crematogaster clariventris) and positively associated with Crematogaster striatula. Also from cocoa mistletoe (Room, 1975); and on cocoa at Kade, by Majer (1975). 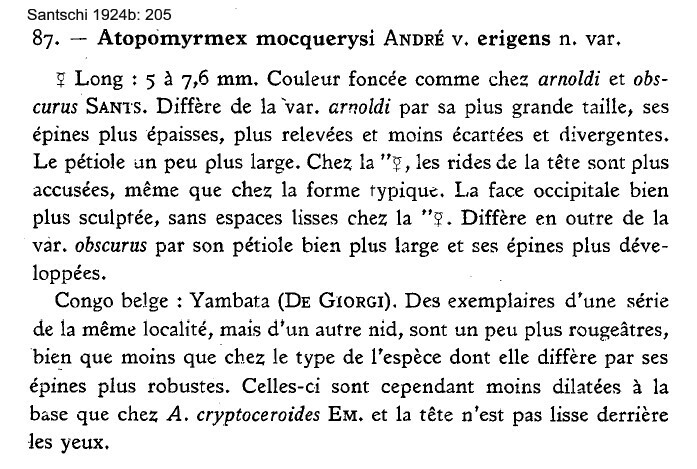 Two workers were collected by pkd from the canopy of Amelonado cocoa at CRIG by Bigger (1981a). 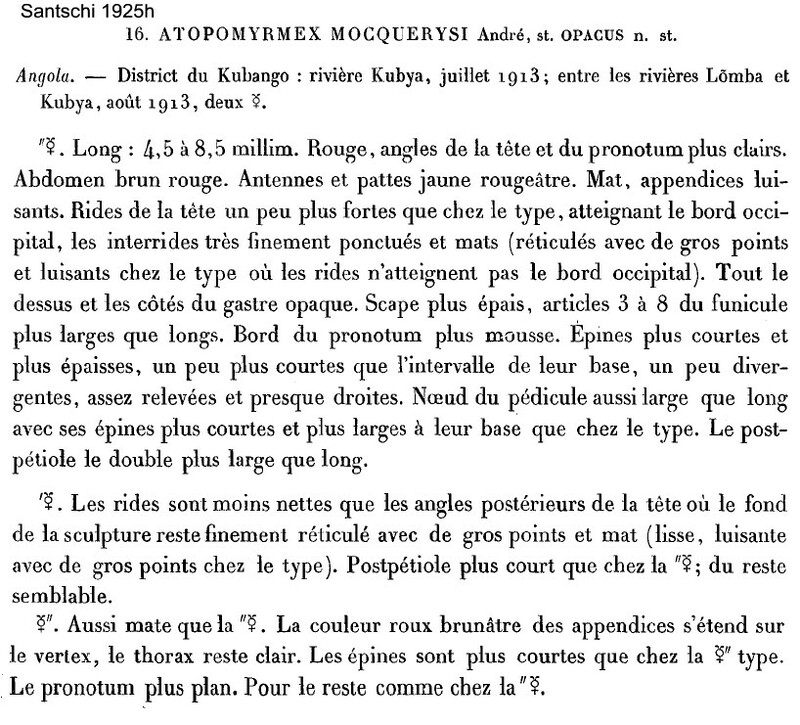 In Ivory Coast, before 1923, Lohier collected it at Jacqueville, see above. 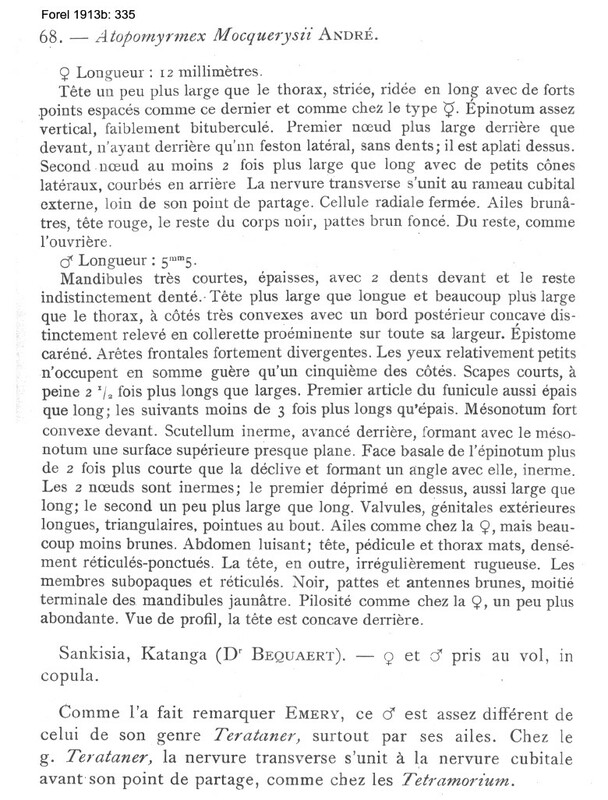 The biology was studied at Lamto by Lévieux (1976b), who gave the diet as being plant sap, seeds and predation on arthropods; and the nest size as some 65,000 adults. Bolton (1981b) has other findings from Cameroun, at Nko'emvon (D. A. Jackson); and Benin, at Cotonou (F. Silvestri, 1913, in Santschi, 1914d). 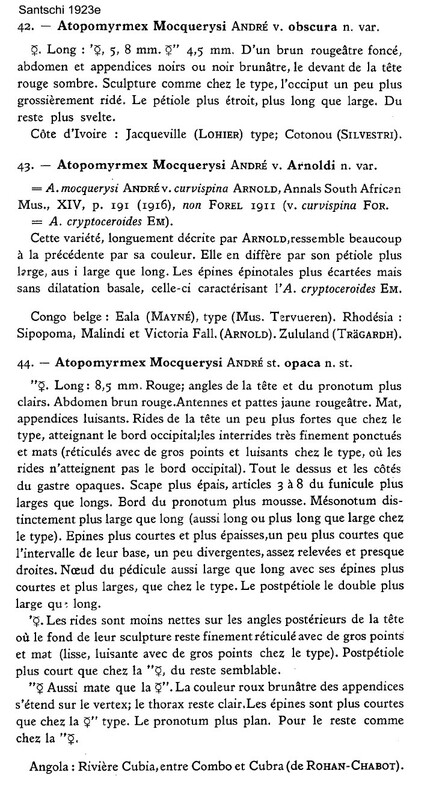 A specimen from Zaïre (Wheeler, 1922) shown in Hölldobler & Wilson (1990, page 99) is crypteroceroides (as above) and not mocquerysi. The photomontage is of a major from the Central African Republic, Camp 1; collector Philippe Annoyer (CAR Camp 1E). The photomontage is of a media worker from Congo, Réserve de Lésio-Louna; collector Eric Zassi (pitfall trap 15, t 3.1). The photomontage is of a media specimen from the Central African Republic, Dzanga-Sangha NP; Camp 3; collector Philippe Annoyer (CAR Camp 3 EW).